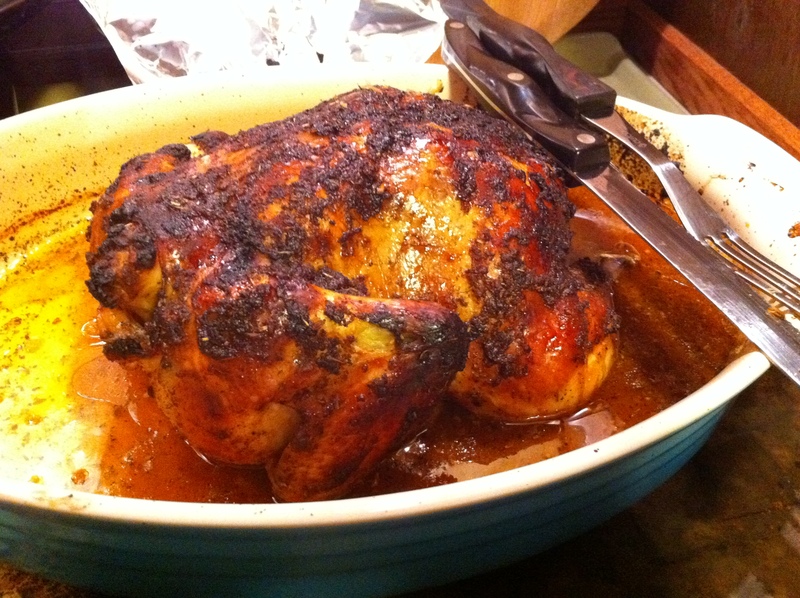 Elana’s Chipotle Orange Chicken = YUM! My second Elana’s Pantry recipe of the day was Chipotle Orange Chicken. It was so freakin’ easy AND tasty! I bought the chipotle chili powder in the bulk spice section at PCC last night. I only got a little bit as I wasn’t sure if I’d use it again. Now I know I’ll be making this regularly, perhaps for the holidays that will be coming along way too soon. a) I need a Dutch/French oven. I added a lovely caribbean blue Le Creuset French oven to this year’s Amazon wish list for Christmas/my birthday. They’re sooo expensive, but I’m keeping my fingers crossed that family will chip in and get me one. I’m excited about the idea of using just one pot for making a chicken, and then heating it on the stove to make gravy from the juices, and then deglazing the pot to make stock or soup. Sounds fantastic and fuss free! Plus Le Creuset is lovely looking, making a serving dish unnecessary too. C’est fantastique! b) I should apply some of the fresh-squeezed orange juice and the rub under the skin and not just on it. Although it made for some tasty skin (which I normally don’t eat). c) I cooked it at 350ºF for ~1hr 40min with no foil for the first 20 and then no foil for the last 20. Worked rather well. d) I amended Elana’s step 3 to use a hand blender with the food processing attachment to save dirtying a bowl and the garlic press. Did I mention our dishwasher is broken? Any chance to limit dirty dishes that I have to wash saves my sanity. And I should add a thank you to my big sis Denise who gave me that hand blender (I’m pretty sure I never wrote a thank you note). e) And after posting, when I went to cut up the chicken, I realized that I need to properly learn how to carve poultry. Place chicken in a baking dish that will fit your chicken and hold juices. In a stick/hand blender with the food processor attachment, combine garlic, herbes de provence, agave, salt and chipolte and pulse to desired consistency. Pour orange juice over chicken and get some under the skin. Rub mixture onto chicken and under the skin. Marinate chicken in the refrigerator, time permitting for up to 3 hours (I did about 2 hrs). Bake at 350° for 1.5 to 2 hours. Once cool enough, remove from juices before trying to carve to avoid splattered orange chipotle juices everywhere (yep, I splattered). Use juices to make gravy. Use bones and left over bits to make stock or soup. I haven’t figured out what to serve with this yet, but the chicken is good =) Not the most glamorous pic, but you get the idea. PS – It isn’t burned; that’s the chipotle chili powder that’s dark. This entry was posted in sparkles, sustenance+sustainability and tagged dairy-free, dinner, gluten-free, Le Creuset, spicy food on 20 September 2011 by cheryl.